I have postponed writing this blog post for quite some time now—almost a year, in fact—because I know what I have to say about one of “America’s most loved bakeries” will probably not be received well among the general public. However, in my defense, I have given it multiple chances of redemption. I’ve gone over five different times and tried multiple menu items, but yet I always find myself disappointed. 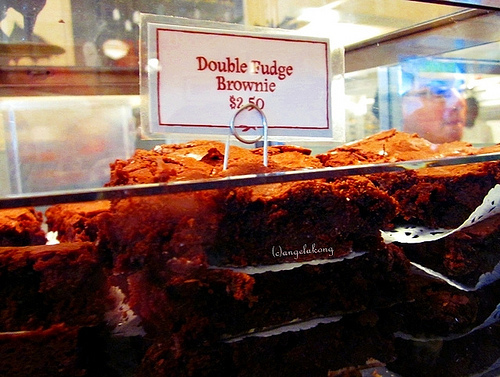 Sure the little bakery is spectacular to look at, and everything is frosted and sprinkled to perfection, but the product itself isn’t that great (in my opinion, of course…I don’t want to upset any of the devout followers of Magnolia Bakery’s sweet-tooth subculture!). Magnolia Bakery opened its doors in 1996, and is often dubbed as the creator of the “cupcake craze” that took America by storm in the late 1990’s. Dessert suddenly evolved into a statement piece, and people were demanding bite-sized, “trendy cupcakes.” Being a foodie and a baker myself, I was super anxious to try the so called “Grand Daddy of all Cupcakes.” On my first visit, I ordered the German Chocolate Cupcake and the Red Velvet Cupcake, as well as a Double Fudge Brownie. The red velvet cupcake was dry, the German chocolate cupcake was painfully sweet, and the double fudge brownie was mildly redemptive and good in comparison to the rest. I actually threw away the two cupcakes after a couple of bites…wasn’t worth the calories! I attributed the terrible cupcakes to the time of day (it was night when I went, so maybe they weren’t freshly baked), the off-chance that there was a substitute baker, and the possibility that my taste buds were off. I didn’t want to believe that they were normally that bad, and so I went again…four more times! I have tried several cupcakes, bars, pies, brownies, and cakes and the cake is always dry, the icing is always too sweet, and the Magic Cookie Bar is always the only thing that I enjoy from my purchase. So if you do go to Magnolia, I recommend that you order a magic cookie bar as a plan B in addition to whatever else you decide to try! 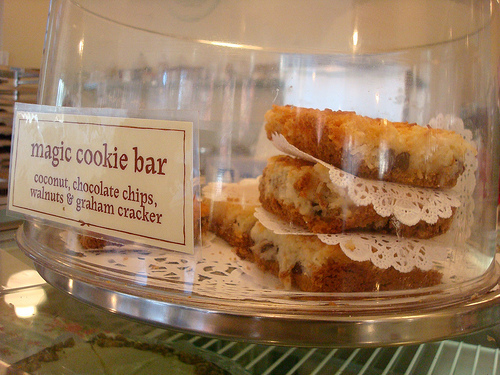 The Magic Cookie Bar is divine combination of graham cracker crumbs, walnuts, chocolate chips, shredded coconut, and condensed milk. Other than that dessert, I am very under whelmed by Magnolia Bakery and think it is overrated. I have eaten the cupcakes at Magnolia Bakery twice. Both times I thought they were very dry. I had the Red Velvet cupcakes and a chocolate one of some sort, I don’t remember the exact name. I found the Red Velvet to be very dry and the chocolate one lacking in taste and just too sweet. Ahh…I am so glad that I am not the only one who finds Magnolia Cupcakes to be too dry! 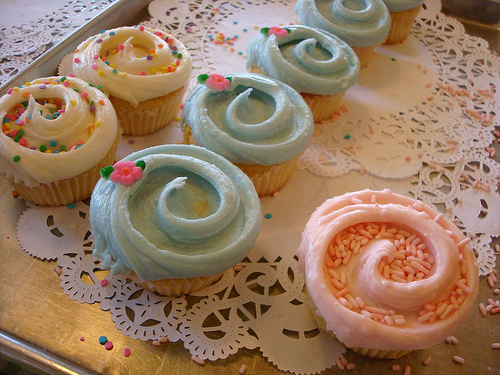 I recently saw a special on Food Network about Sweet Revenge, which is also a cupcake shop in NY. I am hoping to get there on my next visit because their desserts looked awesome, but as I learned from Magnolia, looks can be deceiving.